i have done many imports with this tool by now and i strangly get the error that i joined as attachment, whatever the excel i try to open. i used to have office 2007. here's the thing i tried to deal with this in order. still get the problem, i tought it might be the path that contains > 255 caracs, but wasn't this too. do you have any idea ?? it was working well and i'm not sure about what i've done to get now this error. Please have a look to the two links below. I think this workaround will solve your problem. Bug fixed: Excel Adapter and variant MS Excel language versions! hi robert ! the key i put into my register make this works well ! 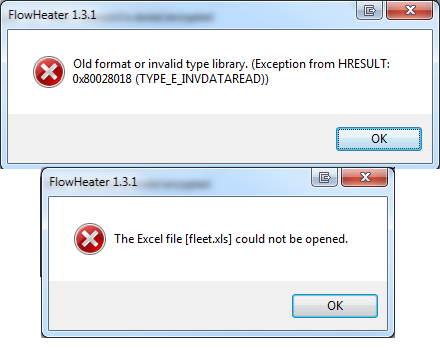 other files are like type-2 etc..
forfiles /m type-1-*.xls /c "cmd /c ..\..\..\..\..\bin\fhbatch.exe /readfilename @path 2-link-tblensembleunepiece-type-1.fhd"
I think the error message appears because in your other excel files (second and third) the worksheet name you have specified in the Excel Adapter isn’t available?